Tonix Pharmaceuticals is starting Phase 2 clinical trials for their form of a very low dose cyclobenzaprine called TNX102 SL. It targets pain and the inability to get restoration from sleep...well, because we don't. You can't get something from something you don't do. It seems that the sublingual form is rapidly absorbed by the bloodstream and is rapidly excreted from the system. This study has approximately 120 patients taking either a tab or placebo at bedtime for twelve weeks and then measuring the change in pain intensity. The first phase of the trial has already been concluded with a reduction of pain, pain sensitivity, fatigue and mood. The study chair for this trial is Dr. Daniel Clauw, Professor of Anesthesiology, Medicine and Psychiatry and Director of the Chronic Pain and Fatigue Research Center at the University of Michigan. Tonix calls this protocol BESTFIT. BESTFIT stands for BEdtime, Sublingual, Tnx102sl, as Fibromyalgia, Intervention Therapy. Cute, huh? Cyclobenzaprine is an FDA approved drug that treats muscle spasms that is associated with musculoskelatal conditions. It's been prescribed off label as a sleep aid. What I didn't know is that there isn't any benefit with this drug after two to three weeks. Actually, what is said was "the evidence of effectiveness for prolonged use is not available." Everything I've read says that this drug should not be used long term. Pain managers have been giving it out and for much longer than two to three weeks. There are not many treatment plans for us out there. The ones that are there have some side effects that make the treatment worse than the affliction! Add to the mix that the treatments don't work for all of us. This study is being conducted at approximately 15 sites throughout the U.S. I can't wait to see the outcome but the initial results were promising. 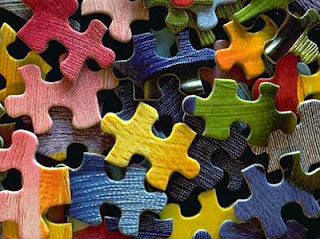 Until we find the missing piece of the puzzle.